About us: SAHAYA Nepal e.V. - SAHAYA Nepal e.V. Webseite! Travelling Nepal is a very impressing experience: the beauty of the country, the rich culture, open and hospitable people, but at the same time poverty, the low level of education and the uncertainty of the future. There is progress in overcomming analphabetism, but many families still can not affort to send their children to school. But the new generation will and have to lead the future ! So education and care are key for progress. 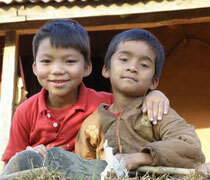 We met in Nepal engaged supporters ad visionaires, who work hard to enable street kids and orphans to go to school. We were impressed how little money can make already a great impact ! By our association we like to help people to help themselfs; we are based on engaged domestic partners we have met and know personally; we support projects especially on education, organize scholar sponsorschips and assist in arranging volunteering in Nepal. We are a small, but highly engaged team. If you like to yoin us in making this world a little better: visit the "projects" page for donations, and / or contact us, we welcome you and any input !